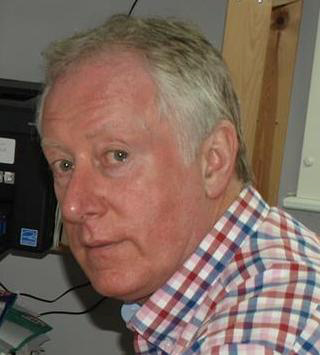 From 1978 until 2011 Gil Keane ran a specialist fitting centre in Birmingham called Quicksilver Automotive. The USP was that whatever customers wanted to achieve in the way of an upgrade to their cars, Quicksilver would make it happen. Initially, this took in bodywork and mechanical work as well as anything electrical or electronic. Eventually, this narrowed down to just the electrical and electronic aspects. 1. Design a range of LED bulbs for both positive and negative earth cars to reduce the load on feeble electrical systems, but which do the job better than conventional bulbs. 2. Use the latest LED technology to allow classic cars to enjoy lighting as good as new cars in all areas. 3. Use the same technology to make classic cars safer to use on public roads – to tackle the “invisibility” factor. 4. Listen to classic car enthusiasts and professional restorers and to address what they saw as problem areas in classic car lighting. 5. Use customer feedback to fuel a constant product improvement programme. 6. Use creative thinking to find new solutions to old problems. Since March 2014, a move to new and spacious premises in the Warwickshire village of Broom has made it easier to achieve at least some of the above. New products are constantly being added to the range. This report first appeared in Jaguar World Monthly and is reproduced with grateful thanks. Many thanks also to author and photographer Roger Kemp. If you are looking for a company that does “what it says on the tin” then at Better Car Lighting that is exactly what you get!Proprietor, Gil Keane, started his working life more than forty years ago as a quantity surveyor.Despite being well qualified he found that surveying lacked excitement and he spent his spare time helping friends to prepare racing cars; he even raced a few himself. The need to keep the cars running at peak performance often with fairly basic tools and a very limited budget required not only dedication but also a fair degree of innovation and skill. You may not be surprised to hear that Gil, on discovering that he had talents that enabled him to bring creativity to fixing race cars, soon made the transition from quantity surveying to motor maintenance. Of course the story is more complex than that and in the fullness of time Gil was running a business employing 28 people in Sparkbrook to the south of Birmingham. He specialised in modifying cars to high standards – for example, at one time he was contracted to install body kits on brand new Peugeots and Fords for the main dealers. Among a range of activities undertaken during the 1970s and 80s, including designing and installing glass sun roofs long before they became de rigueur, he found he had some considerable talent working with aftermarket electrical components and developed a reputation for excellence. He designed and installed the very first rear view camera connected to a car’s satellite navigation as long ago as the mid 1980s. He also made Venom Car alarms which were famous for their “no false alarms” claim and he still uses many of the same parts suppliers today. Gil’s company worked on a number of Jaguars and he has owned several original S-Types, Mk 2s, Series 1, 2 and 3 XJ6s (including a Coupe) and one E-Type. He used to offer an improved handling package for the Series 1 XJ6 which entailed lowering the suspension, fitting individually made flared steel wheel arches and putting bigger Wolfrace wheels on the car with wide tyres imported from America. An XJ6 was once left in his care for three weeks while the customer went on holiday and whilst working on the car he noticed how poor the dip beam headlights were. The outer lights, which are seven inch have a dual filament bulb and serve as dip and main beam, the smaller inner light had a single filament bulb and only comes on when the main beam is on. Gil’s solution, after some minor modifications to the wiring was to fit a dual filament bulb in the inner headlight such that dipped beam used four lights rather than two – the results were superb. He was bemused by the fact that it was possible to take what he considered to be one of the finest cars ever designed and make such a significant improvement. From there, and with many detours along the way, including some horrendous property disputes with the local council, Gil now has a smaller business based on the outskirts of Alcester specialising in lighting upgrades for classic cars with a particular affinity for Jaguar. He has designed and developed the parts he provides such that he can improve the lighting on almost any vehicle built since 1950. He does not supply any standard parts but his upgrades are all designed to fit in original housings. Gil showed me a small incandescent light-bulb of the type originally installed for dashboard lighting. He explained how they become very hot and the molybdenum used on the filament evaporates and puts a silvery coating on the inside of the bulb which means the bulb becomes dim. His replacement LED bulbs give far more light from less wattage and consequently last longer than standard incandescent bulbs and consume less power. He has some fairly dramatic before and after pictures of dashboards lit with normal bulbs compared with his Light-emitting Diode (LED) upgrades. For the early XKs and E-Types which used a tinted film to give a green or blue glow to the dashboard he has even developed replacement LEDs that provide the same colouring. There are one or two early cars that use a dual filament bulb for the front sidelight and indicator. This means that a white sidelight is supplemented by another white flashing indicator and can be very difficult to see. Gil makes a replacement LED that still offers the white sidelight but the flashing unit is orange and thus far more visible. One of his major campaigns is based on the European legislation that has introduced daytime running lights (DRLs). Research suggests that cars fitted with DRLs are 70% less likely to be involved in a head on collision than those without. Those of us with classic cars are only too aware that lack of airbags etc make us quite vulnerable in the event of an accident and anything that can improve our safety is to be welcomed. Gil makes and sells full kits for a number of classic cars that allow the existing side lights to be replaced by much brighter LEDs – installation is fairly straight forward and makes full use of the existing fittings. Interestingly, the DRLs are wired via the ignition and remain on as long as the car as in use. When the ignition is switched off and those same lights are on as parking lights they emit only 25% of the light given by the DRL function. In his combined office and workshop Gil can demonstrate some quite sophisticated arrangements of LED lighting. For example, the comparison between a normal reversing lamp and an LED bulb is quite staggering. He provides LED replacements for all bulbs within the car but, whereas on an E-Type you might find exactly the same bulbs used in a variety of applications, with LEDs the brightness needs to be sufficient for its application without necessarily being over bright – the rear number plate light does not need a daylight white intensity whereas the DRLs at the front need to be visible even on bright sunny days. Each LED is designed to give sufficient light for purpose. Gil has overcome problems of cars with a positive earth by use of what he calls a flip-chip. The electronics within the LED adjust automatically to work with both positive and negative earth. 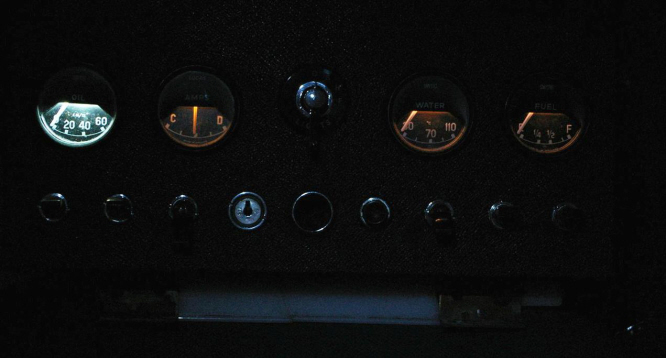 We spoke of the double switch fitted on the Series 3 E-Type that operates the dashboard lights – as Gil says it gives two settings: dim and dimmer… with LEDs it becomes bright and brighter. Gil pointed out that when you drive a classic car it is not unusual to find the person behind driving only four feet from your rear bumper as they try to get a better look at it – a normal light bulb, as used in a brake light, actually takes half a second to reach full brightness during which time the car can have covered 20 feet. LEDs light instantly which is a good reason to use them for brake lights. 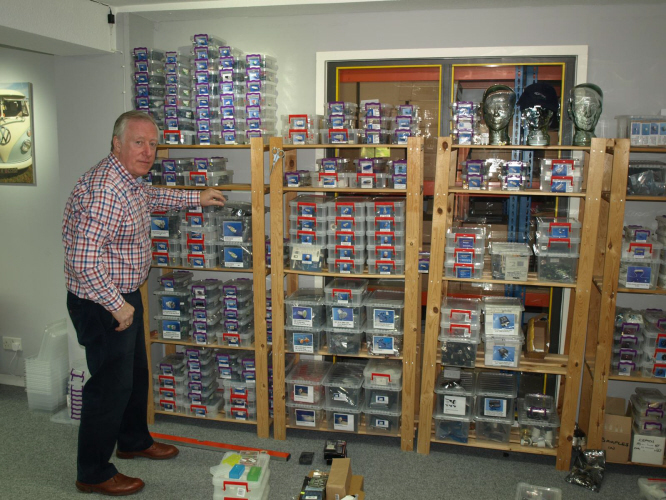 Nearly all of his business is conducted by mail order and he now ships his upgraded parts to eleven different countries with Australia being his biggest overseas market. I was wholly impressed with Gil’s operation and surprised by the affordability of what he sells, for example a complete front light set up for my E-Type including headlights and sidelights is only £129.99. I think I will be treating it to some new visibility in the near future … who knows, when you see a light at the end of the tunnel it could well be me! In this picture the bulbs are (from the left): 1. Conventional; 2. Number plate light; 3. traditional look, low power sidelight ; 4. high power wide angle sidelight; 5. very high power sidelight/daytime running light; 6. high power COB (chip-on-board) sidelight; 7. High power canbus sidelight; 8. Ultra compact high power sidelight, maplight etc. Better Car Lighting also goes under the name of its sister company 4Sight Visionary Lighting, which provides LED solutions for non-automotive applications. Before moving to its current premises, the company provided expertise, non only in lighting technology, but also in automotive audio and GPS, providing complete packages under the name of QuickSilver Automotive. Several articles were featured in Xclusively Jaguar News and will be reinstated in due course. Please visit the 4Sight Visionary Lighting (www.bettercarlighting.co.uk) website for more information.